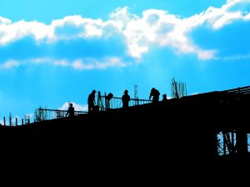 Residential roofers should have fall safeguards just like all other construction workers who work at higher elevations, says New York personal injury lawyer Kenneth A. Wilhelm. A Sept. 28 news report in The Wall Street Journal talks about the debate between government officials who say workers must have fall protection and builders who saw such safeguards may prove costly. Residential roofers in several states including Arizona work without the necessary fall protection below 15 feet because state laws don't require builders to provide them, according to a Sept. 28, news report in The Wall Street Journal. The article states that even though falls make up about 50 percent of residential construction fatalities and 80 percent of residential roofing deaths, builders are reluctant to provide safeguards maintaining that they are expensive and will drive up construction costs. The article gives examples of residential roofing workers who have suffered catastrophic injuries or have died because of fall-related injuries and because they did not have any type of fall safety devices such as harnesses, restraints, safety nets or handrails. While federal rules requires such protections when a worker is at 6 feet, Arizona law requires fall safety devices only above 15 feet. In August, the U.S. Occupational Safety and Health Administration (OSHA) took the unprecedented step of formally proposing to take over construction workplace safety in Arizona because that state doesn't require fall safeguards. All construction workers deserve protection from worksite dangers, particularly falls, said New York personal injury lawyer Kenneth A. Wilhelm. "Falls are among the greatest dangers construction workers face. While those working in commercial construction are more likely to get this type of protection, those involved in residential construction work, particularly roofers, may not be adequately protected against falls," said Wilhelm. Falls often result in catastrophic injuries, Wilhelm said. "Our law firm represents a number of construction accident victims and several of them have suffered from fall-related injuries. Some of the common types of fall-related injuries we see are head injuries, broken bones and internal trauma. Workers may be left with permanent injuries and disabilities, which means they may not be able to return to work or earn a livelihood." The consequences these roofing workers and their families face are real, Wilhelm said. "It is time states like Arizona change their laws in order to ensure that residential roofing workers get the fall safeguards they deserve. Every life is precious. Every building owner, general contractor and employer should have a duty as well as a responsibility to ensure that their workers have a safe and secure work environment," said Wilhelm. For questions or comments please contact the Law Offices of Kenneth A. Wilhelm. Our New York personal injury attorneys can help victims and families with construction accident cases. We can also help with personal injury cases in New Jersey, Connecticut, Pennsylvania, or Florida.